Human Betacellulin, Fc Tag (BEN-H525x) is expressed from human 293 cells (HEK293). It contains AA Asp 32 - Tyr 111 (Accession # AAH11618). The protein has a calculated MW of 36.5 kDa. The protein migrates as 45-50 kDa under reducing (R) condition (SDS-PAGE) due to glycosylation. >92% as determined by reduced SDS-PAGE. 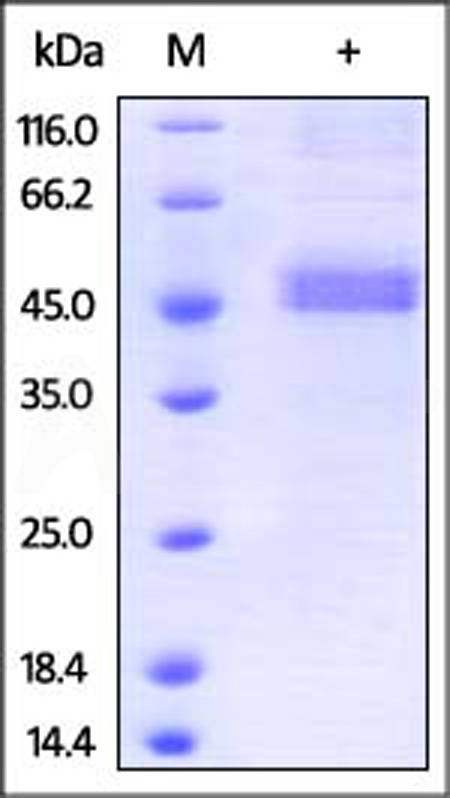 Human Betacellulin, Fc Tag on SDS-PAGE under reducing (R) condition. The gel was stained overnight with Coomassie Blue. The purity of the protein is greater than 92%. Probetacellulin can be cleaved into the Betacellulin (BTC) that is a single-pass type I membrane protein containing 1 EGF-like domain. Predominantly expressed in pancreas and small intestine,Betacellulin (BTC) is synthesized primarily as a transmembrane precursor, which is then processed to mature molecule by proteolytic events. As a potent mitogen for retinal pigment epithelial cells and vascular smooth muscle cells, Betacellulin (BTC) is also the growth factor that binds to EGFR, ERBB4 and other EGF receptor family members. Betacellulin (BTC) was originally identified as a growth-promoting factor in mouse pancreatic β-cell carcinoma cell line and has since been identified in humans. The amino acid sequence of mature mBTC is 82.5%, identical with that of human BTC (hBTC), and both exhibit significant overall similarity with other members of the EGF family. (1) Watanabe T., et al., 1994, J. Biol. Chem. 269:9966-9973. (2) Seno M., et al., 1996, Growth Factors 13:181-191. (3) Bermingham Y., et al., 1996, Oncogene 12:345-353.